Not much has changed at the Glenfiddich Distillery since the first spirit ran from the stills on Christmas Day, 1887. It is still independent; owned and run by the fifth generation of the same family. Our founder, William Grant, aspired to create "the best dram in the valley". He achieved it, and we maintain it - through a single-minded dedication to craftsmanship and quality throughout every stage of production. 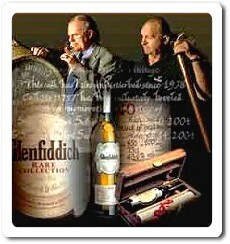 First to widely export whisky, Glenfiddich put Scotch whisky on the map. By 1914 we had 60 agencies abroad; now we are sold in 180 countries on every continent in the world. Glenfiddich is the only Scotch whisky distillery to use a single source of natural spring water. We bought 1200 acres of the Conval Hills that surround our distillery to protect the purity of our supply. From the source of the Robbie Dhu springs, the water is piped directly to our distillery, so nothing can get to the water - not even cattle or sheep are allowed there. As we bottle at source, the soft and clear Robbie Dhu spring water is used both for mashing and bottling. We are the only Scotch whisky distiller in the Highlands to do this. We use the finest malted barley and perform the same process our ancestors used more than 100 years ago. Even our copper stills are the same, every original bump and dent faithfully reproduced lest the flavour should be affected. Thanks to the foresight of William Grant, the company's founder, The Glenfiddich Distillery has inherited an unparalleled collection of Vintage and Rare Whiskies dating back as far as the 1930s. Having quietly matured for many years in oak casks in the traditional dunnage warehouses at The Glenfiddich Distillery in the Highlands of Scotland, a strictly limited number of rare old casks of Glenfiddich Single Malt Scotch Whisky are specially selected by the Malt Master for Private Vintages. The Malt Master selects 4-6 sample casks and from these the Private Vintage customer chooses which cask they would like bottled. A Private Vintage is usually chosen from casks aged between 21 and 29 years, though occasionally older stocks are made available, and each cask typically yields around 250 bottles. All are hand bottled, labels are personalised and each bottle is individually numbered and presented in a cherry wood box. The Glenfiddich Rare Whiskies range is a "stand up and be counted" collection. No other distillery can lay claim to having a land mark collection like this, a collection which includes the oldest Scotch whisky ever bottled, the most expensive Scotch whisky ever sold and, of course "the" whisky voted the World's Best Single Malt Scotch Whisky. The Glenfiddich range won more Gold Medals at the International Wine & Spirit competition in 2006 than any other single malt Scotch Whisky. The world's favourite single malt scotch whisky offers a full range of variants to suit all tastes. Glenfiddich Special Reserve 12 Year Old is the world’s favourite single malt whisky available in over 180 countries around the world. It is the only Highland single malt to be distilled, matured and bottled at its own distillery. The Taste: What first hits you about the fresh and fragrant Glenfiddich Special Reserve is the touch of pear in the nose, followed by a distinctive, well-balanced flavour of rich fruit, subtle pine and a hint of peatiness. Expect a satisfyingly long, lingering and rounded aftertaste. The Glenfiddich Solera system is unique amongst Scotch whisky distillers. 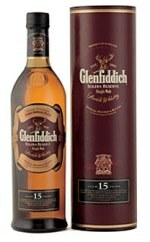 Fifteen-year-old Glenfiddich from three types of casks – traditional American bourbon, Spanish sherry and new oak – is married in a large Solera vat, made of Oregon pine. The vat is always kept at least half full, ensuring a consistent quality of whisky is maintained whenever it is topped up. Then this beautifully balanced single malt is left to settle in a small Solera tun before bottling. The Taste: A full and fruity nose, with delicate honey and vanilla notes. The taste is elegantly smooth, with a deep flavour that reveals fruit, gentle spice and a touch of oak. The finish is long and satisfying. Our master craftsmen have created a complex, mellow single malt Scotch whisky from years of patient maturation in casks which have previously held Oloroso sherry and American bourbon. It is secreted away in our traditional warehouse, where the cool, thick stone walls and low ceilings mature the whisky to perfection. The Taste: An elegant nose, faintly sweet, scented with apple and wood. 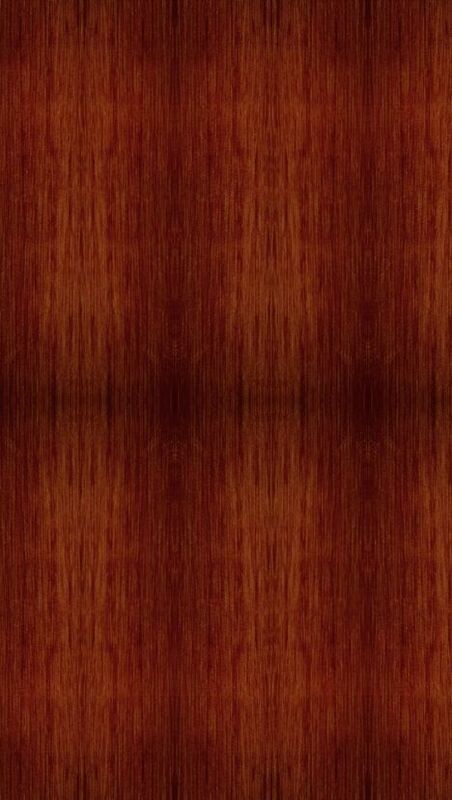 It is robust and full-bodied, yet remarkably soft, rounded and long lasting. Nose: Intense and sweet, floral hints of banana, figs and rich toffee. Taste: Initially soft, then brisk and vibrant, peppery, a touch of smoke, vanilla, ginger, lime, spices and new leather. Finish: Very long, warming and spicy. 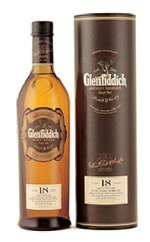 USA Buyers: Click Here for Full Selection of Glenfiddich! 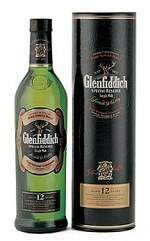 Europe / Asia Buyers: Click Here for Full Selection of Glenfiddich! We are delighted to announce that the Glenfiddich Distillery has won the prestigious title of Best Distillery Visitor Centre in the annual Icons of Scotland Awards, run by Scotland Magazine. Each year we receive thousands of guests from all over the world. We'd be delighted to welcome you, too. Visits to our distillery are free. Each visit starts with an evocative film about the history of the Distillery, after which we show you the very heart of our operation. Feel the heat rising from the mash tun and discover the giant washbacks, hand-made from Douglas fir and five metres high. Experience one of our traditional warehouses - whose earthen floors, stone walls and age-old atmosphere nurture this famous whisky to life. Please Note: Individuals and small groups can come along without booking ahead. However, groups of 12 and over must book in advance. If you are planning a visit to the Distillery, why not take some extra time to enjoy the Glenfiddich Connoisseur Tour? This is the ultimate experience for fans of Glenfiddich single malt Scotch whisky. The tour begins with an evocative film about our pioneering history. Senior guides then take guests on an in-depth tour of the Distillery, including a visit to the atmospheric Solera warehouse. And, as an exclusive highlight, guests then enjoy a tutored nosing and tasting session of our finest whiskies. The tour takes approximately 2.5 hours and tickets cost £20 each. Please note, you must be over 18 to attend. Connoisseur Tours must be booked in advance. During the summer season we are very busy, so we highly recommend that you book well in advance. In addition, all requests for a Connoisseur Tour are subject to confirmation. On receipt of your request we will confirm your booking by email. If the date and time requested is not available we will try and suggest an alternative. We are located on the A941 approximately half a mile north of Dufftown. Once in the vicinity, the distillery is well signposted. Please do not underestimate journey time: roads in this area (particularly the A95 from Aviemore) can be narrow and winding. To help with your journey, we have provided you with brief descriptions of each different route. From central Aberdeen to Glenfiddich is 55 miles (88.5km); from Aberdeen Airport to Glenfiddich is 50 miles (80.5km). This takes approximately 1 hour in fair weather. Take the A96 west, following signposts for Inverness. Go straight across the roundabout on the outskirts of Huntly; approximately half a mile (0.8km) further on, take a left onto the A920 - signposted Dufftown. At the T-junction on the outskirts of Dufftown, take another left which leads you to the village square with a central clock tower. Take a right immediately after the clock tower. This is A941. Half a mile (0.8km) down on the right is the Glenfiddich distillery. From Inverness to Glenfiddich is just over 50 miles (80.5km); from Inverness Airport it is approximately 45 miles (72km). This takes approximately 1 hour in fair weather. Take the A96 east, following signs for Aberdeen. At the second roundabout in Elgin take a right - signposted A941. Follow this road straight through Rothes village until you reach Craigellachie. Look for further A941 and Glenfiddich signs, and turn left to Dufftown. Glenfiddich is approximately four miles along this road on your left. From Edinburgh to Glenfiddich is approximately 175 miles (282km). In fair weather journey time is approximately 3 hours. From Glasgow to Glenfiddich is approximately 185 miles (298km) and journey time can take up to 4 hours. Follow the A9 north and go past the turnoff for Aviemore. Approximately one mile (1.6km) beyond the Aviemore turnoff, take a sharp right onto the A95 and stay on the A95 until you reach Craigellachie. Here the A941 and Glenfiddich are sign-posted on the right.